Already people have begun to ask me questions about the 2018 World Cup! The new stadium is not far from the downtown and appears to be well under construction. This picture was taken from the hydrofoil speed boat on the way to Peterhof. As you can see from this picture a lot of infrastructure development is going on simultaneously with the construction of this stadium. 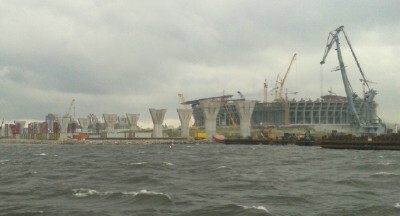 In the foreground there are the pillars that will eventually support a bridge that connects a major highway between 2 of the major islands that make up St. Petersburg. This stadium is located on Kristovsky Ostrov (Island). On the same island are several wonderful restaurants and a huge park with several ponds. There is also an amusement park with roller coasters, a ferris wheel, rides for small children, ponies and much more. Each year in the winter they build an out of doors ice skating rink. As we get closer to 2018 I will update the website with more information about the development of the stadium and infrastructure being built to accommodate the 2018 World Cup! For now, please enjoy this picture taken in August of 2014.